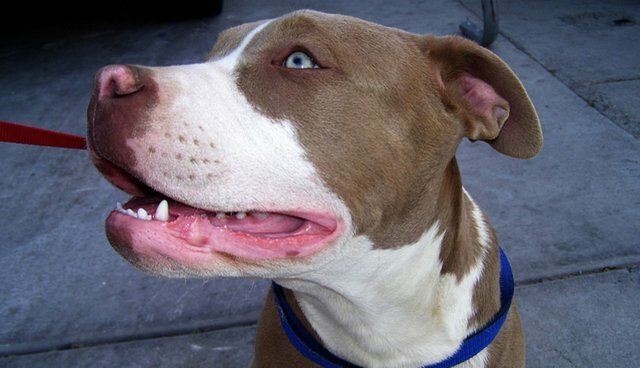 As cities and states across the country move to overturn unfair "breed-specific" laws, one state is considering adopting such a measure. A new law proposed in Mississippi would place restrictions on dog ownership, singling out pit bull types and other similar breeds as "dangerous dogs." The legislation would target American pit bull terriers, American bulldogs, Staffordshire terriers or any mixes of those breeds, The Jackson Clarion-Ledger reports. Owners would have to keep the dogs muzzled when they are off their property and post signs about the "dangerous" dogs. Police would also be permitted to shoot such breeds if they see them unrestrained or without tags. Rep. Larry Byrd, R-Petal, the bill's lead author, told the Clarion-Ledger that he's not trying to ban owning pit bulls, but instead to "bring attention and bring responsible ownership of these dangerous dogs." Similar laws have been received with outrage from animal advocates, who say they unfairly target pit bulls and don't encourage responsible ownership. The organization Stop Breed Specific Legislation said in a statement that the proposed bill "tramples constitutional rights." "As more states prohibit breed discriminatory laws, this would be a huge step back for community safety and the rights of individuals, as well as starting a potential landslide of even more stringent forms of breed discrimination, such as bans across the state." Meanwhile in Kansas, pit bull owners are celebrating. After months of debate, the Roeland Park City Council lifted its own ban on pit bulls Monday night, Fox4 News reports. "If you look back the legislation hasn't been charged since the 1980's so it's really outdated," animal advocate Kelly Davis said. "I think there's a lot of people that don't understand the breed and don't have exposure to responsible owners who have the breed."